It was Cherry Blossom Festival time again in Japan Town, San Francisco. Unlike last year where the trees were in full bloom, this year they had only just started blooming. The weather has been extremely erratic around here swinging from being unseasonally warm and wet, back to bitterly Winter cold. My guess is it delayed blooming. However, despite the late bloom – there were still enough sakura to get everyone excited! As with last year, I planned 3 ensembles. Well, actually, I planned four, as I couldn’t make up my mind about one particular ensemble, so I packed a “spare” just in case. I will post about each ensemble separately. 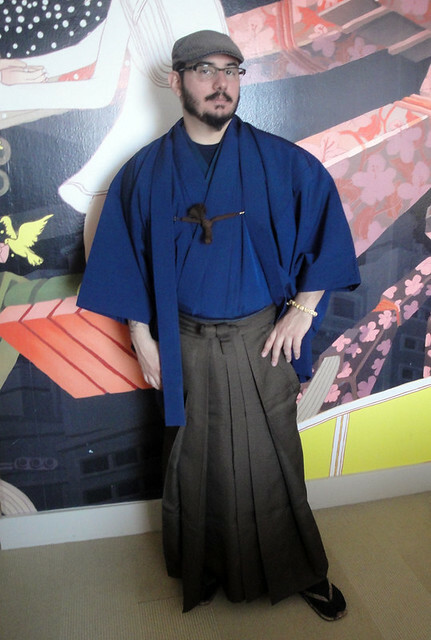 I wore my Taishō era pinkish-purple gradient hōmongi with floral tsuzumi. 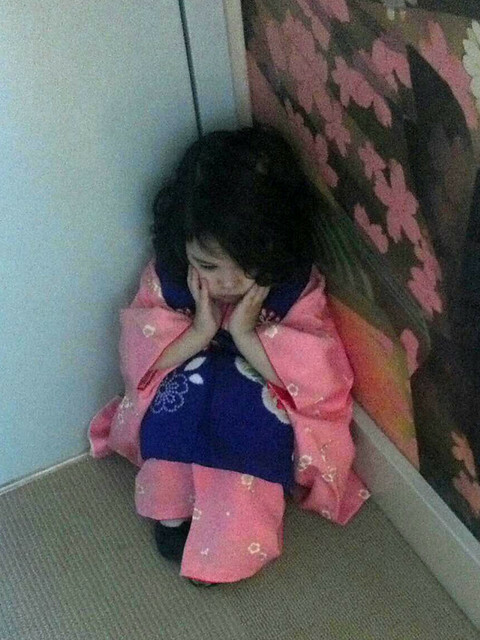 When this lovely hōmongi came into my collection, I knew immediately I wanted to debut her at the Cherry Blossom Festival. Photographs simply can’t do any justice to how amazing she is. It did mean I had to wait patiently for over half a year, which was hard! When my parrot chūya obi arrived a few weeks ago, I knew right away I wanted to pair it with my hōmongi for a lovely and whimsical ensemble. The parrot chūya is a little on the short side, with some staining, but I was able to make it work. And while I normally shy away from yellows, I felt very strongly about introducing yellow accessories to this ensemble to compliment the yellows in the tsuzumi. We forgot to take photos before we left the hotel room – so these were taken after walking around in the wind, and after chasing after, wrangling and carrying Lily all morning! Please be sure to click on the images to view them larger. Many years ago, I received an unexpected, yet lovely compliment from a Japanese artist about how I reminded him of shin-hanga artist and Junichi Nakahara. 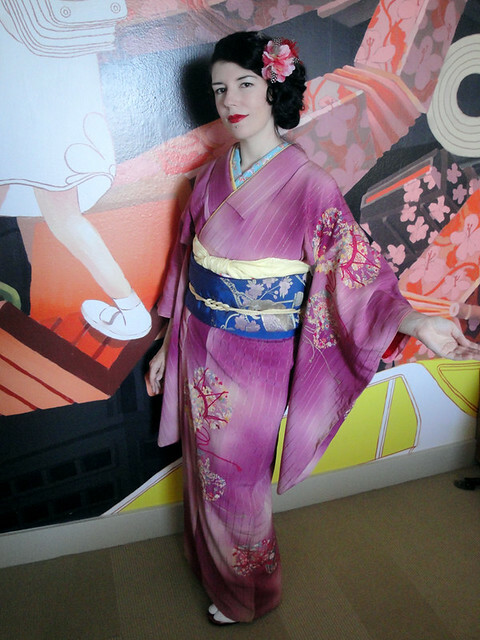 This year, a Japanese gentleman told me that I looked like I stepped right out of a Yumeji Takahisa painting. 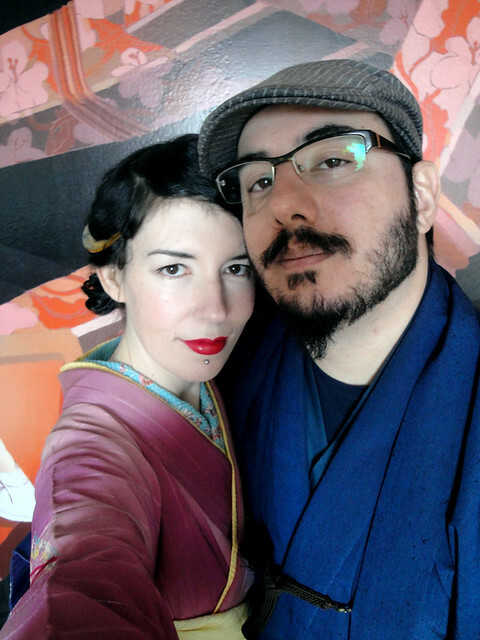 While he loved my ensemble, he was especially enamored with my hairstyle and in particular, how I was wearing the kushi (comb) in Taishō Roman style. I was beyond flattered with his compliment as I worked hard this year in trying to obtain a period correct hairstyle. 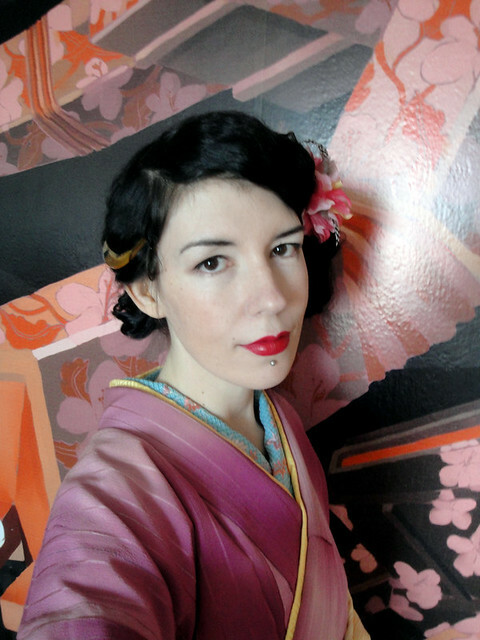 While I’ve had my hair in a Louise Brooks “flapper” bob cut before, which always looks lovely with kimono, I am enjoying having long hair at the moment and don’t particularly feel ready to cut it off short again. So I’ve been doing a lot of research on 1920’s hairstyles, in particularly, focusing on styling extra long hair. While there were those women who cropped their hair short, many women actually kept their long hair, but came up with crafty ways of creating bobbed looks. 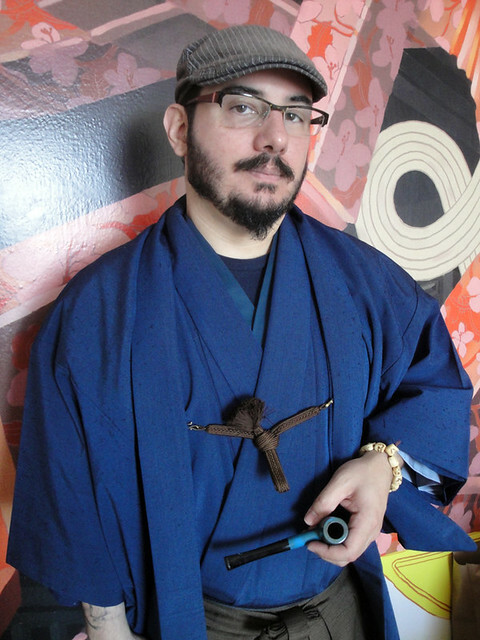 After spending some time experimenting, I finally achieved a passable Marcel waved look, and after extensive researching of Taishō Roman hairstyle fashions both in photographs and paintings, I felt comfortable finally wearing my traditional kushi in the alternative styles worn during Taisho era. In the morning, I started off with one of my smaller, lighter kushi just to be on the safe side. Seeing it never budged, I moved onto a larger and heavier one for the evening.